Freuds helped Public Health England add some star power to its campaign to promote a healthy lifestyle to children. What do Star Wars characters Luke Skywalker and Finn have in common with Olympic gold medallist Jade Jones? Aside from great Jedi moves, they joined Forces for a high-profile Public Health England (PHE) campaign to promote a healthy lifestyle to children as part of the ‘Starting well, living well and ageing well’ programme. 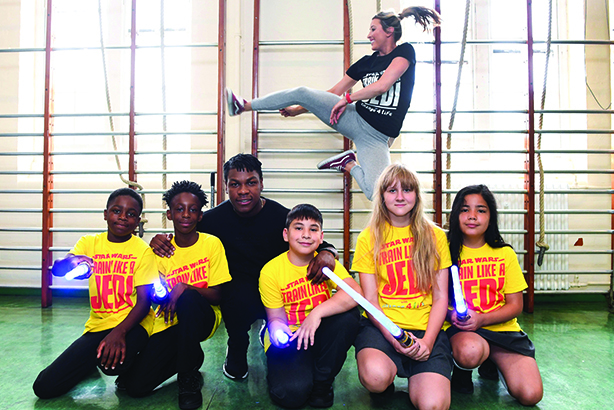 ‘Change4Life – train like a Jedi’ is one of several campaigns that PHE rolled out in 2018. It stands out for its level of creativity and delivering high-impact results to a highly targeted audience of primary school children. Change4Life partnered Disney to get children moving, with Star Wars-themed activities designed to inspire them to ‘train like a Jedi’. In partnership with Freuds, PHE recruited taekwondo athlete Jones, who fronted an interactive play-along video (below) with Jedi-inspired moves; Mark Hamill, the actor best known as Luke Skywalker; media medic Dr Ellie Cannon, who brought to life the importance of young people being active and the health harms associated with a sedentary lifestyle; and actor John Boyega, who plays Finn in the Star Wars franchise. The campaign is based on research that found 80 per cent of children were more likely to be active if they saw their favourite stars moving more. In a launch activation, Boyega stunned children at his old school in a visit with Jones to take part in a Jedi- inspired routine. The campaign secured more than 400 pieces of coverage, including from ITV, the BBC’s Newsround, Evening Standard and the Press Association. The coverage had 100 per cent positive sentiment and 95 per cent contained two or more key messages, including the call to action to watch the ‘Train like a Jedi’ film with Jones. The coverage reached 67 per cent of the key target audience of parents with children aged three to 11.